Borussia Dortmund are finally back! Following a two-month barren spell, where they failed to register a single league win, the black and yellows have finally managed to clinch a much-needed win against Mainz last night. It was the first game in charge for newly appointed head coach Peter Stoger, who replaced Peter Bosz over the weekend. The win will give the Bundesliga giants a massive boost in confidence as they once again return to the top four in the league table. So how did Peter Stoger's men manage to register a victory against this sturdy Mainz defence last night? The game started in a very fluid fashion with Borussia Dortmund, as usual, having a lion's share of possession. Dortmund started out, in what was a 4-1-2-3 formation with Julian Weigl sitting in as the central defensive midfielder alongside two attack-minded midfielders in Shinji Kagawa and Raphael Guerreiro. Without trying anything different, head coach Peter Stoger mostly stuck to the basics, with Borussia Dortmund exhibiting confident passes throughout the game. The only notable difference was the fact that the Dortmund defence was planted rather deep compared to what Peter Bosz's suicidal high line, which resulted in less pressing dynamics but more solidity in defensive stances and counter attacks. Mainz, on the other hand, also exhibited the perfect approach against this passive Dortmund side. The 05-ers started with a three-man backline, with two rather defensive wingbacks in the shape of Daniel Brosinski and Giulio Donati. Sandro Schwarz's side kept defending in deep blocks and waited out for any defensive mistakes from the opponents, which was working quite well for the young manager. However, unfortunately for the 38-year-old, Mainz's attacking line completely failed to make use of their chances or to make any kind of breakthrough toward's opposition's defence which is firmly reflected in their hugely disappointing tally of ZERO shots on goal. To Peter Stoger's credit, however, the team really stuck together as a team and there was a very good balance midfield. Julian Weigl, in particular, was given a freedom to dictate his own style of play. This wasn't the case with Peter Bosz, who forced the young midfielder to provide more in attack whilst ignoring his natural style of play. Weigl completed 71 passes on the night, including a few sumptuous ones. Mainz, however, also lacked defensive consistency on the night. After a rather sturdy first-half display, the 05-ers completely fell apart in the second half with Leon Balogun, in particular often making rash passes to give away possession in dangerous areas. The Carnival club could have gotten away with a point should they had been much more focused on defending their lead. 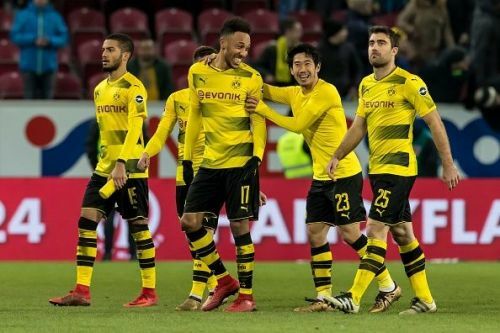 At the end of the day, Borussia Dortmund showed great spirit to constantly heed for that goal-scoring opportunity, which they were finally rewarded with, in the 55th minute. A free kick wreaked havoc in the Mainz penalty area and Dortmund captain Sokratis showed great composure to produce an excellent finish for the Dortmund opener. Mainz defence became even more vulnerable after the goal with the wingbacks joining up the attackers but to no avail. This allowed the Dortmund attackers to find much more space as they attacked Mainz relentlessly on the counter and eventually scored the second of the match through Shinji Kagawa. At the end of the day, it was a relatively easy win for Borussia Dortmund, who will be full of confidence, thanks to the composing nature of their new manager. Head coach Peter Stoger did everything right that night and the likes of Sokratis, Julian Weigl and Marcel Schmelzer have been the obvious beneficiaries of Stoger's appointment. The black and yellows, however, will have to further improve their game in order to win against a much stronger TSG side over the weekend.